By the mid-1980s, approximately 20 years after Tessier reported remarkable achievements in the reconstruction of the craniofacial skeleton with radically new surgical techniques, successful massive en bloc skeletal movements were routinely employed to improve craniofacial function and appearance. Moreover, CT imaging and rigid skeletal fixation systems had been developed, allowing even more complex craniofacial surgical reconstructions. Nevertheless, there remained unsolved problems. The surgical procedures were invasive, and the operations and hospitalizations were lengthy. There was often the need for bone graft harvest, and extensive blood replacement was necessary. Soft tissue problems were often not addressed, and many of the procedures represented what I call “bone carpentry.” The relapse rate for many procedures was relatively high because of the acute intraoperative advancement of skeletal segments against restrictive and deficient soft tissue. Often erroneously termed “distraction,” the period of active device lengthening during distraction osteogenesis. Comprised of bones of the four limbs, pectoral girdle, and pelvic girdle. Comprised of bones of the face, skull, chest wall, and vertebrae. Distraction osteogenesis to fill a central bony defect, by distracting one flanking transport segment toward the center. One osteotomy is made. The period following activation, during which the bony generate undergoes remodeling. The generation of bone between vascularized bone surfaces which are separated by gradual distraction. Bone that forms via a cartilaginous intermediate. Within the distraction gap, a physis-like organization of osteogenic cells. Bone that forms directly from mesenchymal precursor cells, without a cartilaginous intermediate. The time following the osteotomy when initial fracture healing bridges the cut bone surfaces prior to initiating activation. Closed reduction maneuver of the generate, performed prior to or during the consolidation phase. Usually accomplished by manipulation of the distraction device or the application of interdental wire-rubber forces. Typically performed to improve the dental relationship following mandibular distraction. Within the distraction gap, a dense line of proliferating osteoblasts flanking the FIZ, that is actively undergoing mineralization. The number of millimeters per day at which bone surfaces are distracted. The number of device activations per day, usually in equally divided increments to total the rate. Refers to distraction osteogenesis performed across an osteotomy site. Refers to distraction osteogenesis performed across an interosseous suture, without an osteotomy. A histologic finding exclusive to the distraction gap, marked by chondrocyte-appearing cells but without cartilage formation. The generation of intercalary bone. The segment(s) of bone actively distracted during bifocal or trifocal transport distraction osteogenesis. Distraction osteogenesis to fill a central bony defect, by distracting flanking transport segments toward the center. Involves two osteotomies. Distraction osteogenesis to achieve simple bone lengthening, using a single osteotomy. The trajectory of applied distractive forces. With respect to the mandible, for example, often characterized as horizontal, vertical, or oblique. Columns of ossifying bone forming within the distraction gap, surrounding the blood vessels that extend to the PMF. In closing, I want to emphasize that by choice my summary is deliberately personal and relates the contributions to the emerging field of craniofacial distraction by our clinical and research teams at New York University. I thank them and I salute them. I must also acknowledge the significant contributions by similar teams around the world. Their work has contributed greatly to progress in the field and I have learned so much from my colleagues who have challenged and inspired me. Their contributions are documented in the bibliographies at the conclusion of the individual chapters of this book. I am honored and grateful that several colleagues have authored chapters with subjects in which they have demonstrated unique expertise. 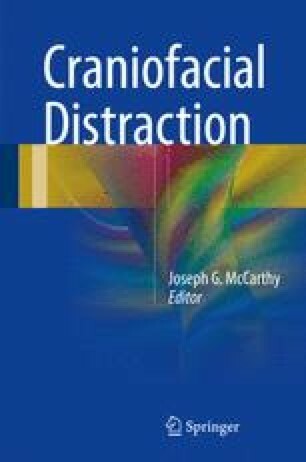 It has been especially heartwarming for me to watch other workers in the craniofacial surgical world adopt the technique of distraction osteogenesis for addressing unresolved problems in craniofacial surgery, a discipline celebrating its fiftieth anniversary at the time of the publication of this book.